Prior to 1434 a bump on the western coast of Africa known as Cape Bojador presented one of the greatest obstacles to European exploration of southern Africa and the Indian Ocean. A confluence of wind patterns and currents made it impossible for ships of the time to sail past that point. In 1434 Henry the Navigator convinced Portuguese mariner Gil Eanes to trust him and sail out beyond the sight of land where he found favorable winds that allowed him to easily explore southern Africa and eventually reach the Indian Ocean. One single voyage doing what others said was impossible was all that was needed to open up vast new trade routes for Europe and to kick off the Age of Exploration. A modern equivalent happened this past Monday, December 21st, when SpaceX succesfully landed the Falcon 9 first stage booster back at its launch site. Succesfully returning a booster back to its launch site and landing it was something many thought was impossible. Now they have been proven wrong. So why is this such an important milestone? Because fuel is cheap. Its the rocket that's expensive. Estimates are that the combined cost of the fuel for a Falcon 9 flight is less than half a million. Now, imagine that each time you take a flight on a Delta jet that they dumped it in the ocean when you finished with your flight. A Boeing 777-300ER costs $321 million and holds 300 people so your ticket would be at least $1.07 million. Industy experts expect reusability to drop the cost of launch by at least one order of magnitude. SpaceX's unique business processes and technology have already cut prices by one order of magnitude. To put that in perspective, prior to SpaceX launch costs were in the $10,000 per pound range. A reusable Falcon 9 booster drops that to below $100 per pound. SpaceX President Gwynne Shotwell told the Satellite Industry Forum in 2013 that a reusable Falcon 9 would cost between $5 million and $7 million per flight. Down from the current $61.2 million. Fundamental pricing changes like that make venture capitalists sit up and take notice. Less than $100 per pound to fly to space. That's something the rest of us can afford. That's something that can enable a new business to be created that was impossible just a few years ago. At that price your local high school could send a mission to Mars. That opens up exploration and settlement of the solar system to everyone in much the same way that rounding the Cape of Bojador did in 1434. Part of my expansion plan for the Georgia Space Society is a bit of advertising around the state to raise awareness. My first experiment is a Facebook ad targeting various keywords and users in the state. Starting tomorrow anyone expressing an interest in “NASA” should see the ad until the $10/day runs out. After tomorrow I'll try a new set of keywords. After that I'll be trying the “if you are one, find one” technique where I specifically target existing members in an area to recruit new members. Can anyone think of other ways of reaching potential NSS members around the state? Back in January I wrote about my basic disagreement with amerciaspace.com. Since then they've simply doubled down on a commitment to a boring, government centered status quo that, in my opinion, is dangerous to human existence. This thread is a good example of the futility of engaging them. Their view is a government centered one that, at my most gracious, smacks of European socialism. A centrally planned approach that doesn't work here. Our country has historically been a capitalist system. Our private enterprise system has produced some of the greatest developments of the past few hundreds years. I'm the kind of American that embraces that history of capitalism and fights against socialist tendencies at every opportunity. And americaspace.com is an example of that centrally planned socialist tendency. In a world such as ours, space is a resource we desperately need to develop economically. Our future survival depends on it. That's why I haven't engaged them and have discouraged others from doing so. Their view of how our space industry should be organized is fundamentally un-American. And that's dangerous. One of the reasons that David Cummings built Atlanta Tech Village was to upend the Atlanta real estate world by providing solutions that fit the needs of startups. But startups need more than real estate. We need insurance, marketing services, accounting, and coaching. Many of those have solutions but some key ones don't. One that doesn't have a good solution is computing hardware. Cloud services has created a wonderful solution for datacenter hardware and centralized services such as fileservers and telephone systems. But one area that doesn't seem to have a good solution is desktop hardware. You can finance it but you are still making payments on an asset that your stuck with for the term of the lease. If your team is fluctuating in size (interns, contractors, etc) then even a 1 year lease can be an issue. What we need is some way of renting a workstation on a monthly basis. One solution is rent a Mac. They host an dedicated Mac Mini equivalent that you then VNC to from your laptop or other device. For employees willing to use their own laptops it is a solution to give them something more powerful. Their basic rental service has two tiers: $25 with a 1 terabyte/month limit and an unlimited bandwidth plan for $45. Its part of the solution but there still needs to be something in between two year leases and trade show rates. I think I'm going to take the audio and turn it into my ringtone. Virgin Galactic's SpaceShip2 flew its first powered flight today. The powered flight lasted 16 seconds and broke Mach 1.2 so they were able to test in flight engine start, transonic flight, and supersonic flight. That's a ballsy test flight! Congrats to Scaled Composites and Sierra Nevada! David Cummings' last two posts discuss optimal size and time frame. Part of my job as the guy running Pipefish is to do my best to organize and direct it with the resources I have. Pipefish began in ernest October of last year. We have spent the last six months testing some of our hypothesis and validating user expectations with our Facebook MVP. We know have two developers plus myself. One is our Lead Designer and the other is Lead Developer. My technical job is building the analytic side of the business. We are very close to the MVP for that side of the business. This summer we are augmenting our startup staff with interns. If we hit our milestones then we are well on our way to “humming”. But there are a lot of ifs on that road. A lot of sales calls and a lot of user tests. Wish us luck! 3) There is little to no overlap between the people I've worked with at Georgia Tech and the people I met while I was working on my MBA. 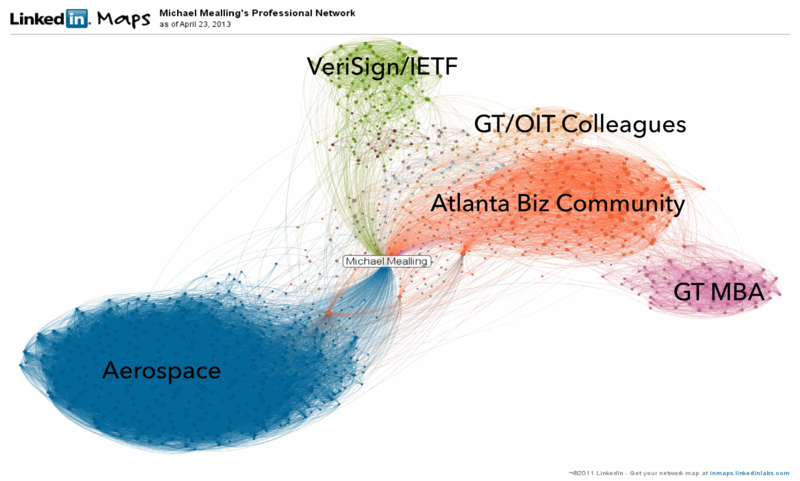 4) There are two very interesting groups in the area between the Atlanta biz community and my former VeriSign and IETF colleagues. A few are COX and CAS Group people but also embedded in there are people who are just connectors in general. People with connections from all over. 5) This view is useful for finding connections you didn't know existed. For example, I found that Scott Henderson (Atlanta biz community) knows Blake Powers (space community). You really should do this yourself. Just go to http://inmaps.linkedinlabs.com/ and login using your linkedin account. I've been using D3.js for a few things lately and, as with many things, with great expressive power comes a higher cost for doing the 'easy' things. The responses to D3 at a lunch and learn this week as part of Big Data Week was a good example of how raw D3 can be intimidating. Enter nvd3. nvd3 is a framework for a standard charts with D3. It standardizes many D3 options so the developer can focus on more important things. That does limit the types of graphs to line, bar, scatter/bubble, and pie charts. It includes two oddballs: a 'bullet' chart and expandable trees. If your project fits in those limitations then try nvd3. It could save valuable prototyping time.